A koi pond is different from a water garden because koi limit the amount of plant life available to be grown. Simply put: koi eat some plants. 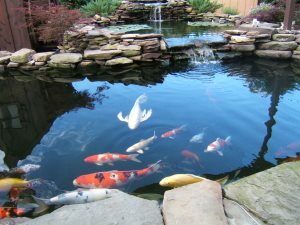 A koi pond should also be larger because koi get quite large despite the size of the pond, it is recommended that a koi pond be no less than 1,000 gallons in volume, the bigger the better. It also needs to have an area of the pond at least 3 feet deep, 4 – 5 may be better. A watergarden typically contains both goldfish and a variety of aquatic plants. 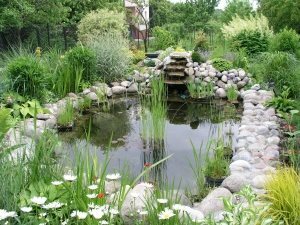 Water gardens in moderate climates usually need for an area of the pond to be at least 2 feet deep. Colder climates require a depth to provide at least 12″ to 16″ of water below the freeze zone.